This is an ancient pressing platform from Lattara, seen from above. Note the spout for drawing off a liquid. It was raised off the courtyard floor by four stones. Masses of grape remains were found nearby. Credit: Michael Py, copyright l'Unité de Fouilles et de Recherches Archéologiques de Lattes. 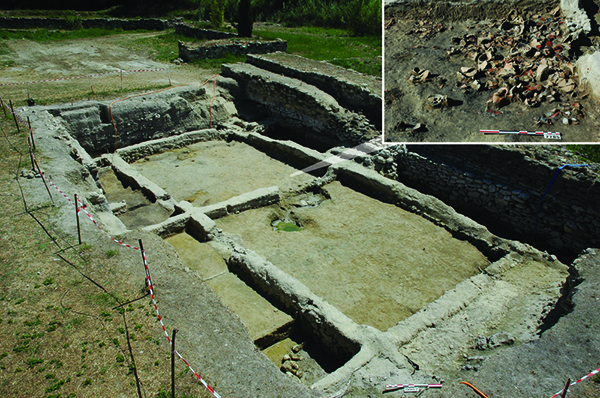 mported ancient Etruscan amphoras and a limestone press platform, discovered at the ancient port site of Lattara in southern France, have provided the earliest known biomolecular archaeological evidence of grape wine and winemaking—and point to the beginnings of a Celtic or Gallic vinicultural industry in France circa 500-400 BCE. Details of the discovery are published as "The Beginning of Viniculture in France" in the June 3, 2013 issue of Proceedings of the National Academy of Sciences (PNAS). Dr. Patrick McGovern, Director of the Biomolecular Archaeology Laboratory at the University of Pennsylvania Museum of Archaeology and Anthropology and author of Ancient Wine: The Search for the Origins of Viniculture (Princeton University Press, 2006) is the lead author on the paper, which was researched and written in collaboration with colleagues from France and the United States. For Dr. McGovern, much of whose career has been spent examining the archaeological data, developing the chemical analyses, and following the trail of the Eurasian grapevine (Vitis vinifera) in the wild and its domestication by humans, this confirmation of the earliest evidence of viniculture in France is a key step in understanding the ongoing development of what he calls the "wine culture" of the world—one that began in the Turkey's Taurus Mountains, the Caucasus Mountains, and/or the Zagros Mountains of Iran about 9,000 years ago. "France's rise to world prominence in the wine culture has been well documented, especially since the 12th century, when the Cistercian monks determined by trial-and-error that Chardonnay and Pinot Noir were the best cultivars to grow in Burgundy," Dr. McGovern noted. "What we haven't had is clear chemical evidence, combined with botanical and archaeological data, showing how wine was introduced into France and initiated a native industry. "Now we know that the ancient Etruscans lured the Gauls into the Mediterranean wine culture by importing wine into southern France. This built up a demand that could only be met by establishing a native industry, likely done by transplanting the domesticated vine from Italy, and enlisting the requisite winemaking expertise from the Etruscans." These are remains of the foundations of the Etruscan merchants' quarters in Zone 27 of Lattara, dated ca. 525-474 B.C. Amphora nos. 4, 5, and 7 came from the concentration of amphoras in Room 15 (top right inset). Credit: Michel Py, copyright l'Unité de Fouilles et de Recherches Archéologiques de Lattes. 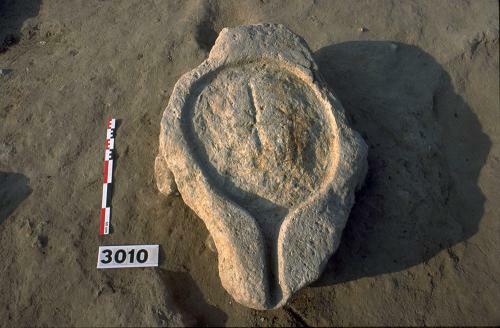 For nearly two decades, Dr. McGovern has been following the story of the origin and expansion of a worldwide "wine culture"—one that has its earliest known roots in the ancient Near East, circa 7000-6000 BCE, with chemical evidence for the earliest wine at the site of Hajji Firiz in what is now northern Iran, circa 5400-5000 BCE. Special pottery types for making, storing, serving and drinking wine were all early indicators of a nascent "wine culture." Viniculture—viticulture and winemaking—gradually expanded throughout the Near East. From the beginning, promiscuous domesticated grapevines crossed with wild vines, producing new cultivars. Dr. McGovern observes a common pattern for the spreading of the new wine culture: "First entice the rulers, who could afford to import and ostentatiously consume wine. Next, foreign specialists are commissioned to transplant vines and establish local industries," he noted. "Over time, wine spreads to the larger population, and is integrated into social and religious life." "As the larger Greek world was drawn into the wine culture, " McGovern noted, "the stage was set for commercial maritime enterprises in the western Mediterranean. Greeks and the Phoenicians—the Levantine successors to the Canaanites—vied for influence by establishing colonies on islands and along the coasts of North Africa, Italy, France, and Spain. The wine culture continued to take root in foreign soil—and the story continues today."